Our customer base is predominantly African countries and in particular mining and oil exploration companies both well established and newly formed and both of which have a use for the type of equipment we supply. 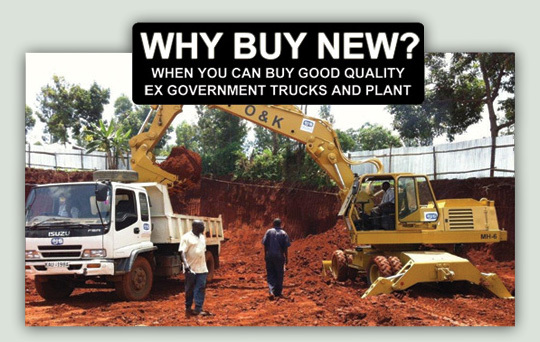 Buying new equipment from a manufacturer involves massive capital costs, technical issues and lengthy order timelines by comparison, buying old worn out high usage equipment means simpler technology but is an inherently unsound albeit necessary practice for some as it involves high maintenance costs, down time through breakdowns and issues over parts supply. Our products fit neatly into the middle of these two options providing older machines which do not need computers to diagnose breakdown issues but which have done very little work due to having been previously owned by the military. Military machines are usually purchased on a money no object basis which means that they have all the optional extras the manufacturers can fit and whilst in military service they are maintained again on a money no object basis but the one main difference over a civilian machine is how much it is used. A 15-20 year old machine in civilian life will have tens of thousands of hours use on it and the condition will be poor whereas an identical machine having been in service with the military will have only a few thousand hours use at most and in some case hundreds of hours only. For young companies just starting our company offers the capital savings needed to get ahead and the reliability of equipment to stay ahead. PLEASE NOTE THAT GOODS PURCHASED FROM US ARE SUPPLIED FROM THE U.K. MAY REQUIRE AN EXPORT LICENCE, FOR FURTHER INFORMATION VISIT THE EXPORT LICENSING SECTION OF OUR WEBSITE.